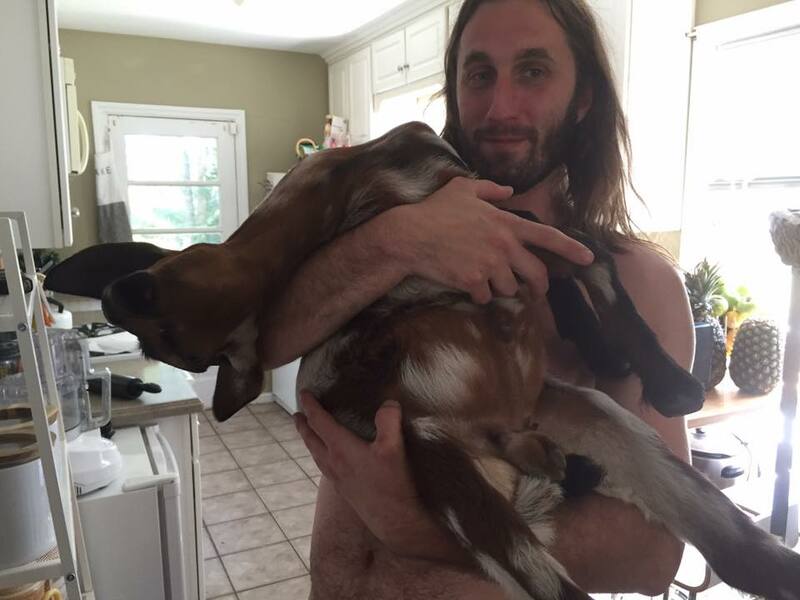 On June 18 we brought home our very first goat. We drove down south of Macon to pick him up from farmer Ken and fell instantly in love. He was so scared the whole ride home, but he calmed down when we played Janis Joplin, so it was almost immediately agreed upon that we should call him Bobby McGee (nobody needs another goat named Billy), but since we knew this boy would go on to sire a heard, we gave him the proper title of Sir Robert McGee. Why a goat, you might ask? I had taken Jason up to show him the mountain property I'm sitting on in Hiawassee, GA and it was covered in poison ivy. Our untamed back yard, like many Decatur yards was covered in english ivy, choking out the native trees, and poison ivy that kept getting Jason every time he worked back there. We had been at the Georgia Renaissance Festival a month or so prior, and it just dawned on me that the amount of time we spent falling in love with the petting zoo goats might have subconsciously played into the "goats are awesome–we need GOATS for our ivy." I'm not going to lie, it took some talking into. Jason is a dreamer and I'm the "practical" one. He spent a good amount of time doing research on available goats; at first I didn't take him seriously, but he was persistent! He had also grown up around goats at his grandparents' so it was less of a strange endeavor to him. I had always wanted backyard chickens and bees (I'm still determined to make it happen, damnit), so it wasn't too far of a step and before too long I was on board. This week our Bobby turns one. Hard to believe he's fathered three kids and is the hoss he is today! Happy birthday, Bobby McGee, our OG.